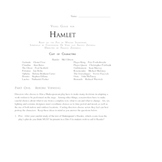 This document is a simple chart which students can use to compare the 1968 Zeffirelli version of Romeo and Juliet to the !996 Baz Luhrmann version. 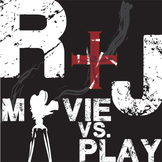 For this essay, students must watch one of three movie adaptations based on "Romeo and Juliet" ("West Side Story," "Romeo + Juliet," or "Shakespeare in Love") and compare and contrast it to the original play. Included are the assignment description, a suggested essay outline, and writing tips. 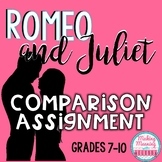 This note-catcher allows students to compare and contrast Baz Luhrman and Carlo Carlei's adaptations of Romeo and Juliet. I have included a teacher's note at the beginning of the note-catcher, explaining how I implemented this in my class. 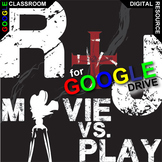 This guide asks students to compare and contrast aspects of the play and Baz Luhrmann's film interpretation. It includes a graphic organizer for the characters and three paragraph response questions for students to answer. This graphic organizer is to be used as a comparison between the dialogue of Shakespeare's "Romeo and Juliet" and the 1995 movie version starring Claire Danes. The graphic organizer specifically examines tone, diction, and style. 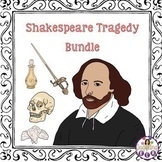 This bundle contains four unit plans for Shakespearean Tragedies that are commonly taught. 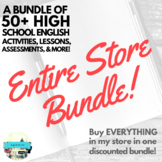 This bundle is perfect for teachers that teach multiple grades. 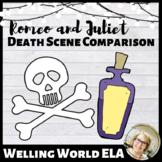 The units in this bundle include: Hamlet, Othello, Romeo and Juliet and Macbeth. You can click on the individual products to see more details.